I finished Olivia's hat (WIP here)...finally. I'm not even sure how many times I ripped it apart and started again, but in the end I realized that the pattern as written fit the girls (smaller yarn, smaller hook obviously made a difference). The second time was much easier (thank goodness the girls have similar head sizes) and that was good because EJ was very anxious for her own hat. I love that they have the same hat but that they look different because of the different yarn. Liv likes to wear hers down and EJ likes a rolled brim. I like that I used cotton, so they will be washable as the girls trash them this summer! I used a G hook and made the adult-sized pattern as written. Super cute! Love Liv's smile in this picture!! They both look so super pleased with their hats. Great job Mummy!!! I especially love Liv's tee-shirt. LOLOL!!! Yikes, sorry about the multiple-frogs---I hate starting a project like that. But these were worth it, they look gorgeous and Grace is such a nice yarn, they must be lovely to wear. 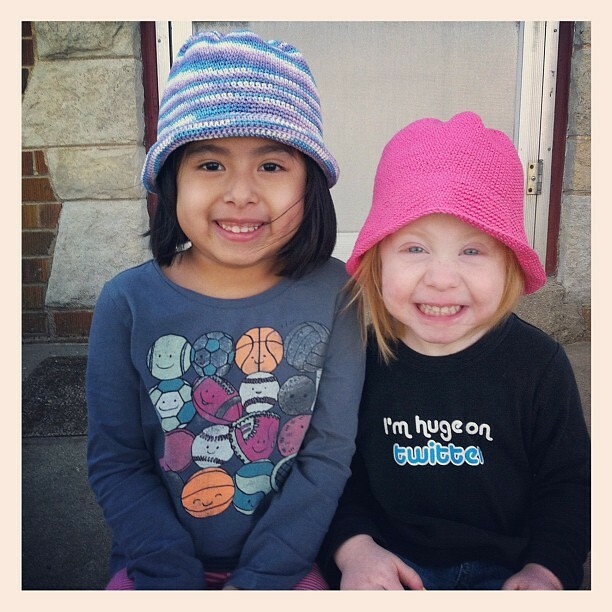 Hard to say what's cuter - the hats or the models. Ok, the models win :). You did an excellent job with their hats. judging by the pictures of the lovely girls, they're thrilled. I like rolling my slouchy hats too, my daughter likes to keep hers down.